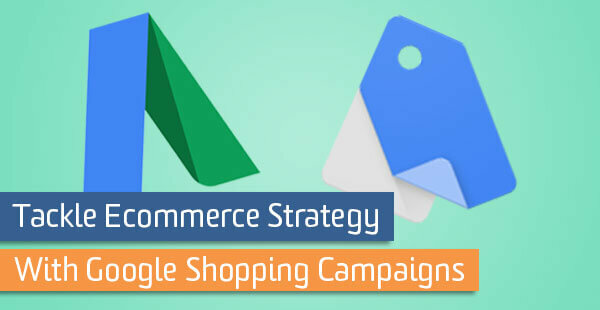 Shopping campaigns are among the most prominent B2C ecommerce uses of the Google AdWords platform. You can build a detailed and affordable ecommerce marketing solution if you take the time to invest in the right technologies and product integrations ahead of campaign launch. I’m specifically referring to the shopping ads you might see on Google, like in the example below. Let’s take a look at our approach to building and launching these sort of AdWords campaigns. At the heart of all Shopping campaigns is a Google Merchant Center feed where you upload your products that you would like to use in your campaigns. When creating your Shopping campaign, the default setting is to target your entire product inventory. This means that any item in your Google Merchant Center shopping feed is eligible to appear in an ad. You are left managing all of your products with one campaign and one ad group. Regardless of the size of your business, managing your products in this way is a sizable challenge because you have little control over how your money is spent. Steps must be taken to effectively manage toward ecommerce goals. You should sub-divide product groups, use advanced campaign segmentation, and take advantage of inventory filters in your campaigns in order to focus on your most profitable lines of business. Before we go down that road, let’s rethink our process from a broader perspective. Your goal is to always take control over your investment in order to manage toward ecommerce KPIs, such as average margin, average order size, ecommerce conversion rate, shopping cart abandonment rate, and the list goes on. Managing toward these goals is increasingly difficult when you have little control over which products are visible to searchers and at what times. Stop, take a deep breath, and ask yourself a few questions before diving right into your Shopping campaign build. There is a lot happening behind-the-scenes of your business and many of those concerns can be taken into account if you plan accordingly. The answers to these questions will ultimately determine how you segment, sub-divide, and filter your Google AdWords Shopping campaigns. What are your margins on different products and categories? Are your products competitively priced? How competitive is the ad ecosystem for each of your brands? Logistically-speaking, how well do you handle product inventory and fulfillment? Does seasonality affect sales performance? This step should not be overlooked. Only after answering these questions will you have enough insight to start building toward success. Before we get to strategy (I promise we’ll get there) and before we even get to work in Google AdWords, let’s stop for a moment and review our shopping feed for new opportunities. Taking the time to create a detailed shopping feed is the first step to success. After doing so, you will have new targeting at your disposal once you get to the campaign creation stage. This is what makes advanced product sub-division, segmentation, and filtering possible. You are probably familiar with the common attributes like title, brand, price, ID, condition and so on, but did you know that you can customize your feed to reference many of product-level conditions pointed out above? The product_type attribute is used to identify product categories based on your internal naming conventions. This is very different from the Google Product Category attribute – google_product_category – which accepts rather complex values predicated by Google’s product taxonomy. Using the fishing lures example, you might identify these products by simply calling out the product_type value of Fishing Lures > Spinners. 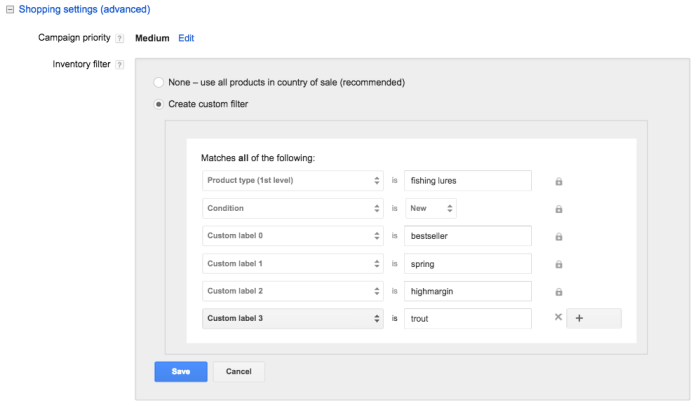 This provides you with simple, familiar nomenclature which you can reference later in your AdWords Shopping campaign via product group sub-division and advanced inventory filters. 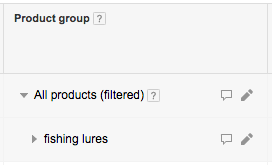 To put the importance of this concept in perspective, let’s look at Google’s naming convention for the same product category: Sporting Goods > Outdoor Recreation > Fishing > Fishing Tackle > Fishing Baits & Lures. Not only is the former easier to understand, we can reference it directly in our Shopping campaign later. Each custom label represents a user-defined value that can answer one of the questions posed above. For example, we might use custom_label_0 to identify product selling rate or custom_label_1 to identify seasonality or custom_label_2 to identify margin. You are ultimately in control of the custom label definitions and the values they accept (don’t use spaces). In the fishing lure example I’ve used here, we might even use custom_label_3 to identify the type of fish the lure is designed to catch. Keep track of your custom label definitions and just remember that each product can only accept one value per custom label. If there is no value to be assigned to specific products, leave the field blank in those instances. We will use these in a few moments. Another useful GMC feed customization comes by way of channel exclusions. You can entirely prevent products from appearing in shopping results by using the excluded_destination attribute, which accepts the value of “Shopping” by default. If you have products with expected costs that outweigh expected revenue, just exclude htem. In other words, we often times use this attribute to identify products not expected to meet ecommerce goals like ROAS. The Google Merchant Center feed attributes identified above are just some of the ways we build more descriptive product references into our feeds. There are many more opportunities to do so beyond those defined here. Now that you’ve improved the quality of the data provided by your feed with the product attributes above, you can filter your campaigns or sub-divide product groups based on these values. This process isn’t rocket surgery, but you just need to know where to click to find the settings. Sub-dividing product groups is the basic approach to building out a Shopping campaign. Doing so allows you to control bids with a higher level granularity. Product groups can be defined with a variety of product attributes from “All products” down to the individual item IDs. If you’ve taken the time to incorporate the custom labels as outlined above, you can also sub-divide down to those user-defined values. Just click on the pencil icon to start sub-dividing your product categories. Remember: these product categories are dependent upon the values in your Google Merchant Center feed including those custom_label_# and product_type attributes you set above. In this example, we segmented by product type but you can choose any attribute from the menu. You can also sub-divide multiple times to drill further and further into the product qualities. This approach, which we would recommend, leaves you with a sophisticated campaign configuration that allows you to control bids at various levels. Coincidentally, using product sub-division is also the way in which we would create more specific ad groups within a Shopping campaign. We know that we can exclude products directly in the Google Merchant Center feed by using the excluded_destination attribute as explained above. We can also exclude products in the campaign by, interestingly enough, sub-dividing product categories and adjusting the bid of a specific product group. Here we see three individual products, and we want to exclude one from the campaign entirely based upon its recent performance. Just click on the max. cpc bid as if you were to edit it, then select the “Excluded” option. Voila! You have removed an item that is negatively affecting your ecommerce performance. Sub-division is great for taking control of your bidding strategy, but what if we want to divide a larger budget across multiple product categories. To implement a more advanced strategy like this we need to take advantage of our advanced Shopping campaign settings, specifically the custom inventory filter option. These are somewhat hidden in your Shopping campaign settings. You will find these in your under an expandable link called “Shopping settings (advanced)” that appears near the top of the page. This is where the real strategic implementation comes into play. Leveraging this feature allows you to filter the eligible inventory before it even has a chance to make it into the consumer-facing search results and spend your budget. By creating this advanced filter, we can dedicate the remainder of our standard campaign settings – budget, bidding strategy, geo-targeting, day-parting, etc – to a specific segment of our product inventory. As it would happen, these qualities provide a solution to many of the ecommerce concerns outlined at the top of this page. Once the campaign launches, our focus would turn toward growing our reach as much as possible and persuading users to add these products to their shopping cart. Keep all of the aforementioned points in mind as your approach your campaign build or optimization. If planned accordingly, your budget will go much farther than you might expect. If you know that seasonality plays a particularly strong role in producing meaningful ecommerce results, then make sure to customize your data and implementation to take advantage of that knowledge. If it doesn’t make sense to spend $1 per click on an item that costs the customer $2, then exclude these from appearing in your feed or campaign. If you make 80% of your revenue from your bestselling products, then build a campaign dedicated to these to maximize your results. Now that all of the pieces are in place and you have a handle on targeting and settings, think about how you might take advantage of these to bolster your Shopping campaign strategy. Perhaps not all of the ecommerce factors outlined throughout here have meaning to your business, but you now understand how to make the most of the targeting options at your disposal.